Last night, Joe Manganiello attended the 2015 Tony Awards at Radio City Music Hall in New York City. 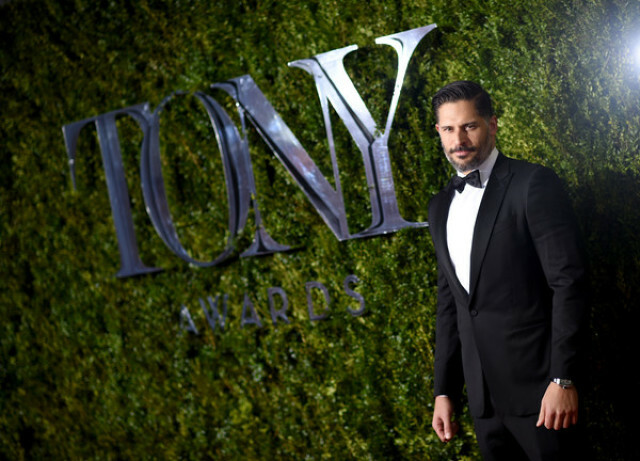 True Blood’s Joe Manganiello came to the stage during the 2015 Tony Awards to present the first-ever Excellence in Theatre Education Award. The awards show partnered with Carnegie Mellon University to honor theater educators in the U.S. who have made a big impact in the lives of their students. The inaugural award was given to teacher Corey Mitchell from the Northwest School of the Arts Charlotte, N.C. during the Sunday, June 7 ceremony on CBS. Joe Manganiello, a Carnegie Mellon alumni, started his presentation by saying which teacher had inspired him. He then went to the audience to ask the Broadway stars which drama teacher they will never be able to thank enough for their encouragement and knowledge. Two-time Tony winner Sutton Foster also went to Carnegie Mellon and thanked her high school drama teacher. Darren Criss, who is currently starring on Broadway in Hedwig and the Angry Inch, thanked Manganiello for teaching him a move or two in Magic Mike, but then sweetly thanked one of his own former teachers. Manganiello then announced Mitchell as the recipient of the Excellence in Theatre Education Award. Although the moment was brief, it’s great to see the Tonys taking the time out to honor the people who helped mentor and train the stars who are on the Broadway stage today. I saw Joe’s presentation of the Excellence in Theatre Education Award. What a wonderful idea to honor theatre educators who have trained and inspired today’s Broadway stars. Re: the Tonys … best awards show ever!! JOE IS SO HANDSOME AND HAS OUTSTANDING TASTE IN WOMEN I MUST SAY ! ALEXANDER ON THE OTHER HAND SEEMS TO LIKE SMALL LITTLE BONE SKINNY WOMEN WHO DON;T SEEM HEALTHY AT ALL ! FOR A BIG MAN THAT IS SHOCKING TO ME IN A WAY I THINK HE CAN DO MUCH BETTER THAN ALEXA CHUNG SORRY I JUST CAN;T SEE THEM TOGETHER ! I REALLY THOUGHT HE WOULD BE WITH A WOMEN FROM SWEDEN BUT WHATEVER TO REACH HIS OWN ! JOE IS GREAT !